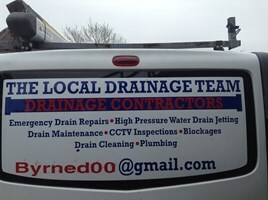 The Local Drainage Team - Drain/Sewer Clearance based in Egham, Surrey. Hi there, thanks for visiting my profile page. I am a sole trader,which keeps my costs lower for my customers. I have 40+years in the building industry and carry out many property functions. I cover main drains , gullys, all internal Drainage and external. CCTV inspections ( see what's going on down there ) Roding, wriggle worm extraction to leave you with happy free flowing drains,and peace of mind. I garauntee my work as well . Give me a call anytime. I work out of Egham and cover a 15 mile radius, this way I can be attendant in a very short time.